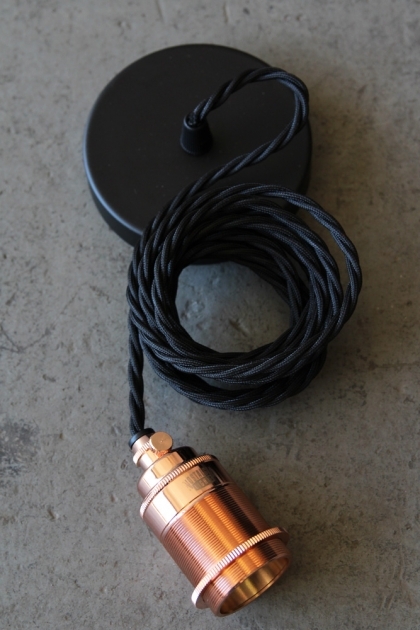 This Vintage Copper & Black Pendant Set is a favourite at RSG! We love anything that is multifunctional and can be customised to be unique to you. 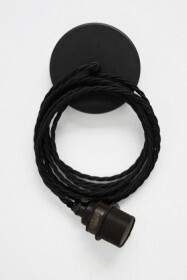 The Pendant Set comes complete with 3 meters of three core, twisted fabric cable, an Edison Screw cable grip lamp holder in an antique finish and a black steel ceiling rose. 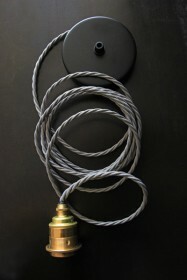 The lamp holder is multifunctional and ready to use with lamp shades (shade ring included) or by itself. These fab lighting kits are a perfect solution to your industrial/vintage lighting needs without the fuss of having to wire the lamp holder and cable together. 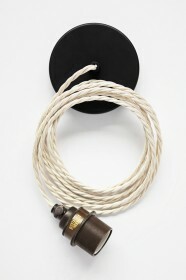 These pendant sets come with Edison Screw lamp holders with thread, so have the versatility to be used with a shade ring to support a lampshade if desired. Please note: The lamp shade must have an aperture of 40mm or used with an adapter to fit a smaller aperture. The enormous three meters of fabric cable flex can easily be cut to size. We advise you consult a certified electrician when installing.